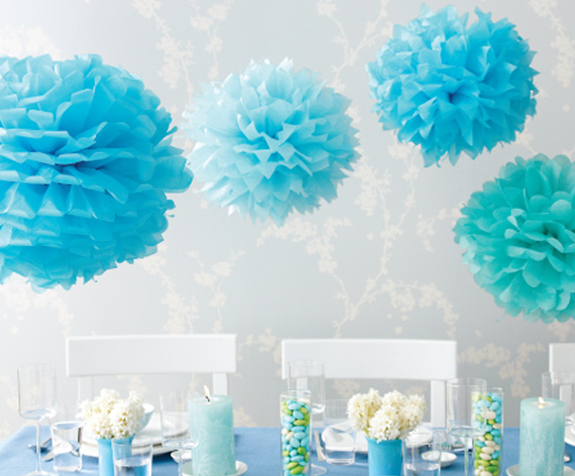 Here’s a DIY wedding design trend that’s easy to do and easy on your budget: tissue paper flowers. Check out the inspiration photos below. Aren’t they fun? Limited only by the amount of time you have to create them, paper flowers can add a big, whimsical, visual impact to your wedding décor. True, no one is going to mistake your tissue paper flowers for the real thing, but they can offer festive style at virtually no cost. Hang them from the ceiling for a magical effect, or cluster them in vases for a creative centerpiece. They’re the perfect accent for your rehearsal dinner or casual wedding reception. 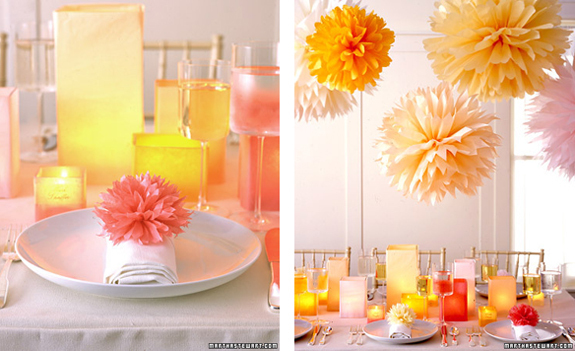 Coordinate tissue paper colors with your wedding palate. All you need to get started is the tissue and pipe cleaners. 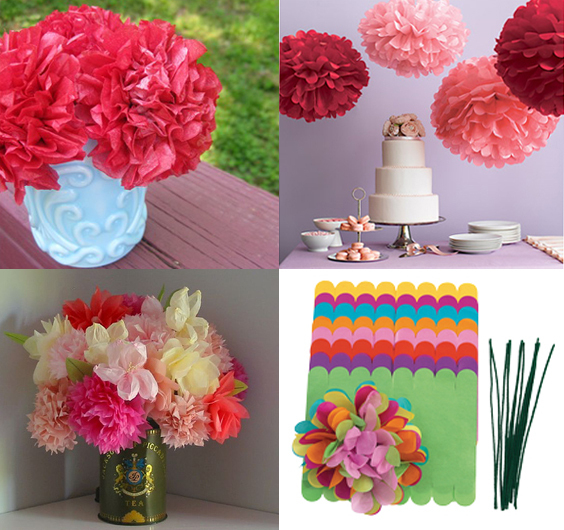 You can also find a great selection of paper flowers online at Etsy. These come preassembled – it just takes a little bit of time to “fluff” them up. Even if you decide to use a craft store kit, or buy from an Etsy retailer, the cost is still very economical for these stylish accessories. What else do I love about these faux flowers? They won’t end up in the trash can days later. You can reuse them for parties or use them to decorate your new home together. This is AWESOME!!! Going to pass idea along too! What a great idea and very colorful and cheap to make. Once you have mastered making them you could apply the same technique to other special occasions, for example, Christmas. Those are soooo cuteee !!! A friend of mine saved up her tissue paper from all her bridal showers to decorate for her wedding. Saving money AND recycling!! Very pretty. These flowers look amazing, they don’t even look fake. A great way to save money on your wedding but still make it look fab! Hello, fantastic idea for fresh, bright colourful flowers, they look so good. I’ll tell the brides that book our Bay of Plenty wedding venue to give these a go. Where is the best place to find the subtle shades of tissue paper? I am looking for coral and teal.